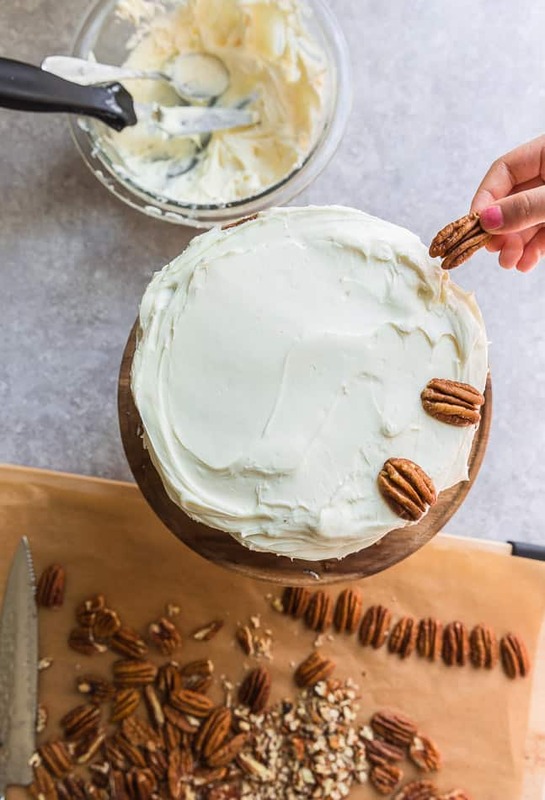 This Low Carb Carrot Cake is tender, moist and packed with coconut, pecans with a delicious cream cheese frosting. It’s a healthy, grain-free, sugar-free dessert with warm spices that is perfect for spring and Easter. Spring is in the air and carrot cake is a must for this time of year. When it comes to the perfect carrot cake from scratch, everyone has their own preferences. Some love a moist carrot cake with pineapple while others just want a plain and simple carrot cake. My family is crazy about carrot cake like carrot cake pancakes and Carrot Cake Energy Bites. 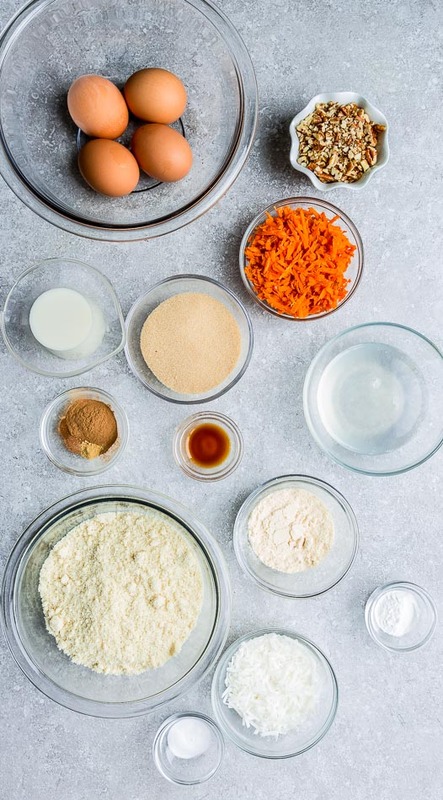 Ever since switching to a grain-free diet due to health issues, I’ve been on a mission to convert many of our favorite carrot cake recipes using low carb ingredients. 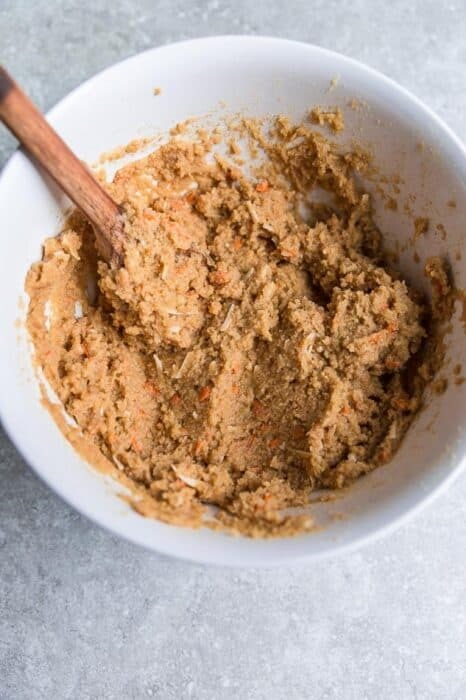 After a few tweaks here and there, this low carb carrot cake has all those amazing flavors we love in a classic carrot cake. Not only is this the best tasting paleo carrot cake we’ve made, but it’s a cinch to make. 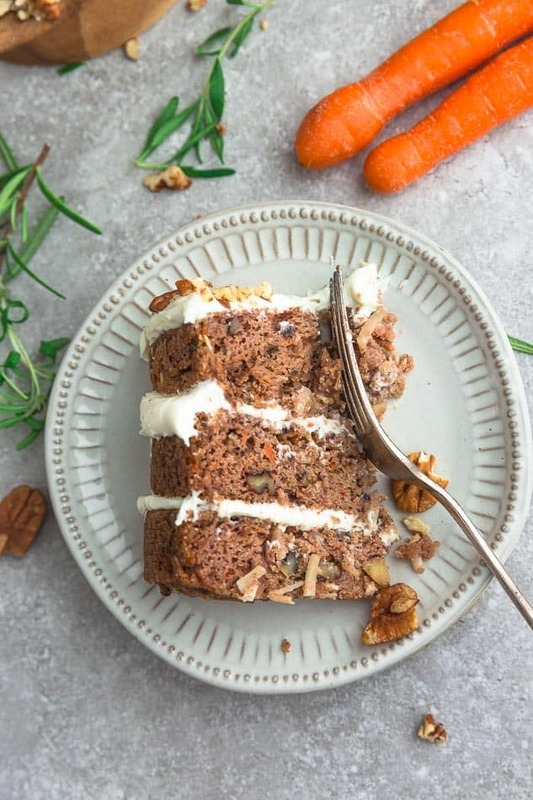 Our keto carrot cake recipe from scratch is full of flavor, packed with spices, tender moist and utterly delicious. This from scratch carrot cake recipe is packed coconut, pecans and carrots and doesn’t require a mixer. 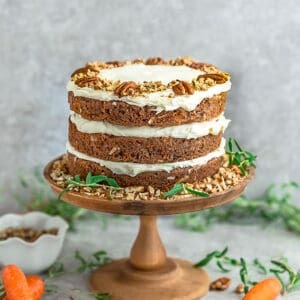 CAN I HAVE CARROT CAKE ON A LOW CARB / KETO DIET? 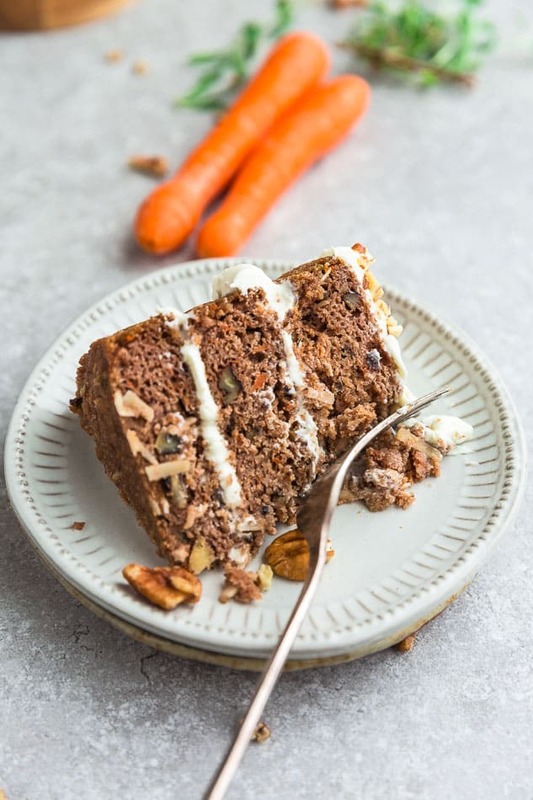 Since this diabetic-friendly carrot cake is sugar free, low in carbs (only 5 net carbs per serving including frosting) and grain free, you can certainly enjoy a slice or two even if you are keto. WHERE IS CARROT CAKE FROM? 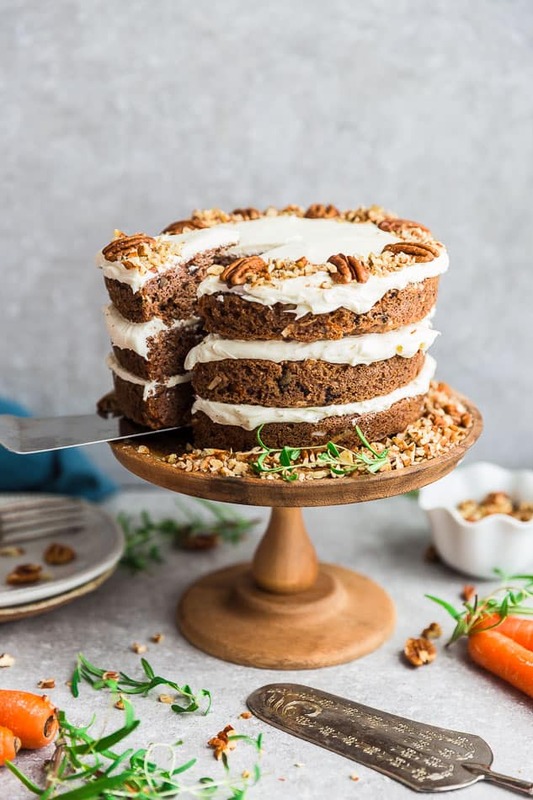 Nobody really knows the full history behind carrot cake but many food historians believe carrot cake originated from carrot puddings eaten by Europeans in the Middle Ages. It wasn’t until the second World War that it became popular because of rationing. 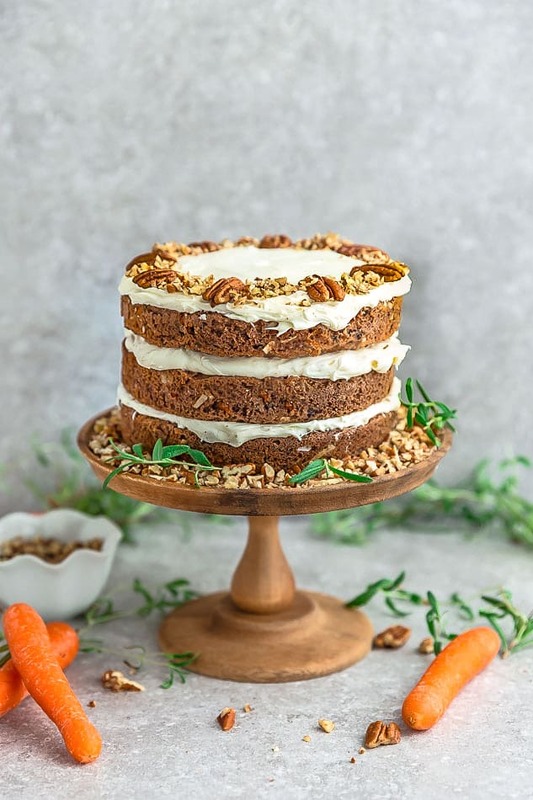 Classic award winning carrot cake recipes are typically made with a combination of butter, all purpose flour, eggs, raisins, sugar, pineapple and cozy spices like cinnamon, nutmeg with crunchy walnuts or pecans. 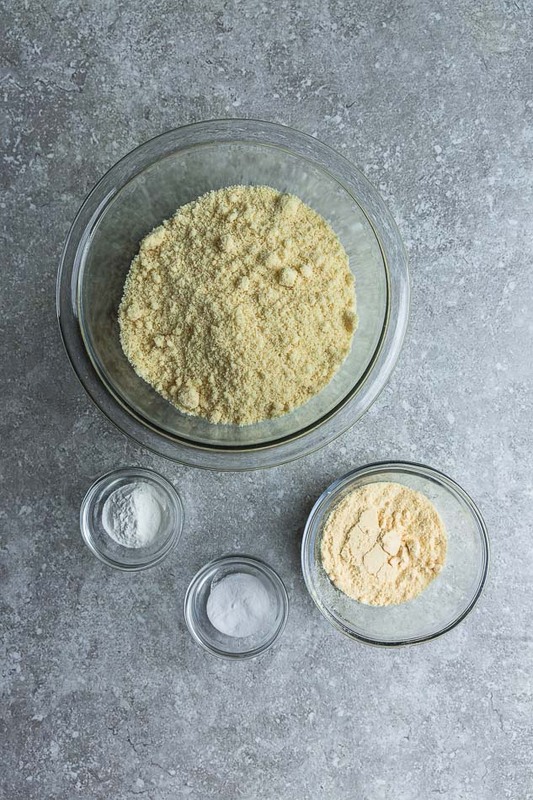 Baking Powder and Baking Soda: leavening powders that work together to help the cake rise. Spices: cinnamon, nutmeg and cloves give the cake that classic carrot cake flavor and make the cake taste amazing. Golden monk fruit sweetener: a low-glycemic sugar-free sweetener that resembles the taste of brown sugar but is keto-friendly, diabetic-friendly and paleo friendly. If you don’t have golden monk fruit sweetener, you can swap with another low carb sweetener like SWERVE, erythritol or stevia. And if you are not low carb, coconut sugar would work as well. Melted coconut oil: makes the carrot cake tender and moist and adds a light coconut flavor. You can also use any other neutral flavored oil or melted butter if you are not dairy-free. Vinegar: combine with the almond milk and let it sit for 5 minutes until curdled = homemade vegan low carb buttermilk to make the cake soft and moist. Unsweetened shredded coconut: adds texture, crunch and bring out the flavors of the cake. Grated carrots: I like using finely grated carrots and usually use a hand grater. However, you can use a food processor or a or buy pre-grated carrots from the store. Nuts: chopped pecans or walnuts add texture and crunch to the cake. However, I know that some people prefer carrot cake without nuts so feel free to leave them out if you want a nut-free carrot cake. Raisins: raisins are high in sugar so we left them out of our recipe but if you are NOT following a low carb diet, feel free to add them in if you like carrot cake with raisins. PREHEAT THE OVEN AND PREP THE CAKE PANS: Preheat oven to 350 degrees F. Lightly coat three 6-inch round cake pans or two 8-inch cake pans with nonstick baking spray and line the bottom with parchment paper rounds. Set-aside. 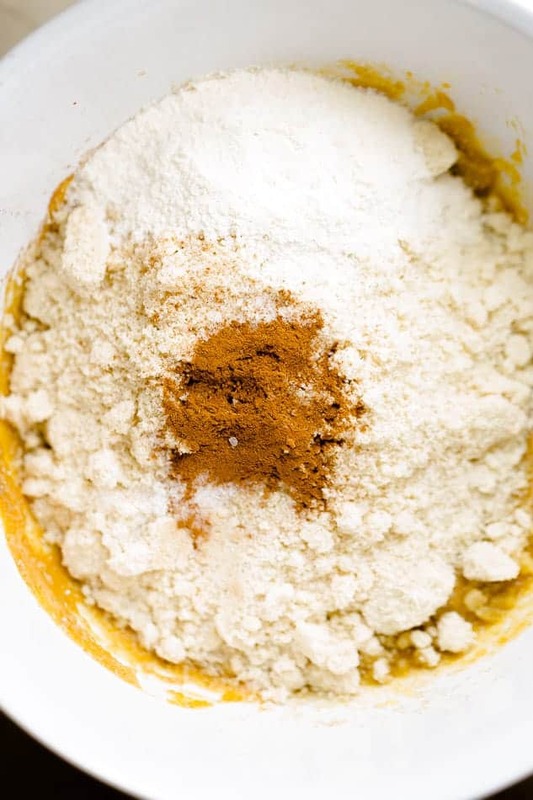 MIX THE DRY INGREDIENTS: In a medium mixing bowl, whisk the almond flour, coconut flour, baking powder, baking soda, cinnamon, nutmeg and salt together. Set aside. COMBINE THE WET INGREDIENTS: In a separate large bowl, whisk together the eggs, golden monk fruit, coconut oil, vanilla extract, almond milk until smooth. Stir in the carrots and shredded coconut. ADD DRY INGREDIENTS TO THE WET INGREDIENTS: Slowly add the dry ingredients to the wet ingredients. Stir with a wooden spoon until well combined. Add chopped nuts, if using. TRANSFER THE CAKE BATTER TO THE PANS: Evenly divide the batter between the baking pans and smooth out the tops with a spatula. BAKE THE CAKE: Bake for 21-24 minutes, or until a toothpick comes out clean. COOL THE CAKE LAYERS: Allow paleo carrot cake layers to cool in the cake pans for at least 30 minutes, then carefully remove from cake pans. Transfer to wire racks to cool completely to room temp before frosting. When it comes to frosting and assembling a paleo layer cake, it’s just like any other classic layer cake and couldn’t be easier . 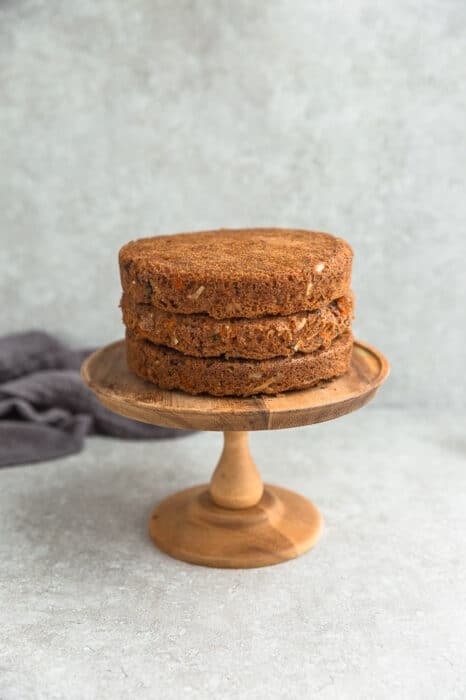 Once the paleo carrot cake cake layers are completely cool, invert the bottom cake layer onto a cake stand or cake platter and add a layer of frosting, smoothing with a spatula. Repeat with second and third layer (for 6″ inch cake) then decorate the top layer (and sides of the cake, if desired) with remaining frosting. Garnish with chopped pecans and chill in the fridge for an hour or two before slicing. 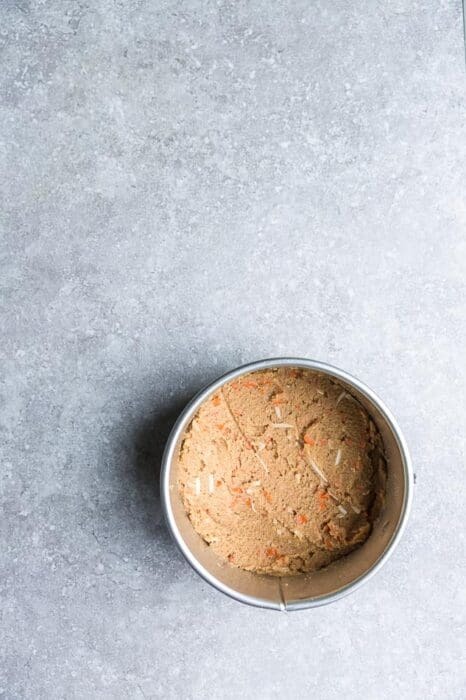 To store leftover keto carrot cake, store in an airtight container for up to 5 days or cover with plastic wrap and store in a resealable freezer bag in the freezer for up to 3 months. 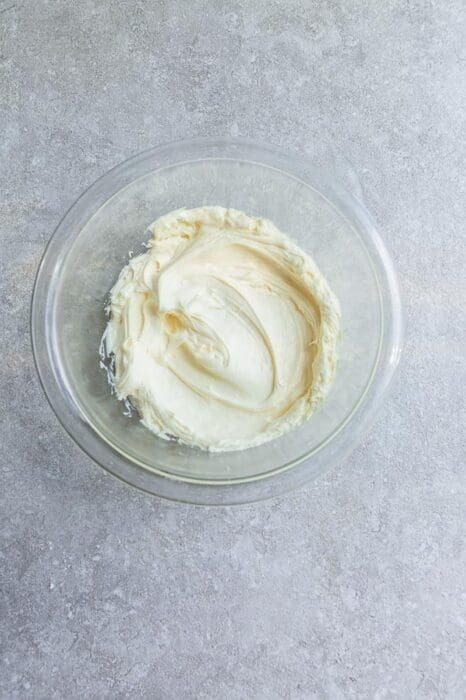 HOW LONG CAN YOU STORE CREAM CHEESE FROSTING? So does cream cheese frosting have to be refrigerated? Cream cheese frosting can be left at room temperature for up to 8 hours. After 8 hours, stored cream cheese frosting in a sealed container in the fridge for up to 4 days or 3 months in the freezer. Carrot cakes can grow mold if not stored properly especially if your kitchen is hot. s long as your kitchen isn’t hot – be sure to cover and store in the fridge overnight for up to 5 days if not eating right away. So can I make carrot cake with pineapple and applesauce? The great thing about making your own carrot cake is that you can use ingredients to your liking. If you are not following a low carb / keto diet, add pineapple and applesauce to your carrot cake batter. By swapping out the coconut oil with applesauce or pineapple, it will add even more moisture to the cake. If using canned pineapple, be sure to drain it first before adding to the cake. 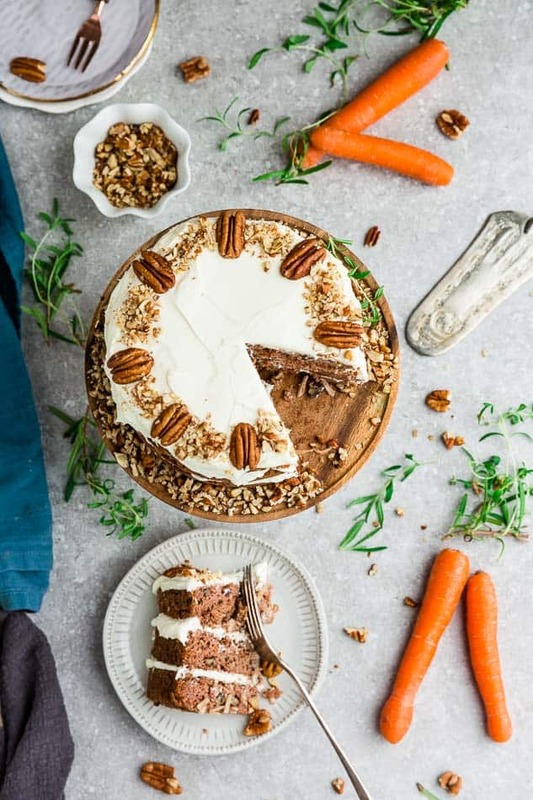 This Low Carb Carrot Cake is tender, moist and packed with coconut, pecans with a delicious cream cheese frosting. It's a healthy, grain-free, sugar-free dessert with warm spices that is perfect for spring and Easter. Lightly coat three 6-inch round cake pans or two 8-inch cake pans with nonstick baking spray and line the bottom with parchment paper rounds. Set-aside. In a medium mixing bowl, whisk the almond flour, coconut flour, baking powder, baking soda, cinnamon, nutmeg and salt together. Set aside. In a measuring cup, measure out the almond milk and add the vinegar. Allow to sit and curdle for about 5 minutes while you mix the other ingredients. In another separate large bowl, whisk together the eggs, golden monk fruit, coconut oil and vanilla extract. Pour in the curdled milk and mix until combined. Stir in the carrots and shredded coconut. Slowly add the dry ingredients to the wet ingredients. Stir until well combined. Add chopped nuts, if using. Evenly divide the batter between the baking pans and smooth out the tops with a spatula. Bake for 19-24 minutes, or until a toothpick comes out clean. Allow cakes to cool in the cake pans for at least 30 minutes, then carefully remove from cake pans. Transfer to wire racks to cool completely to room temp before frosting. 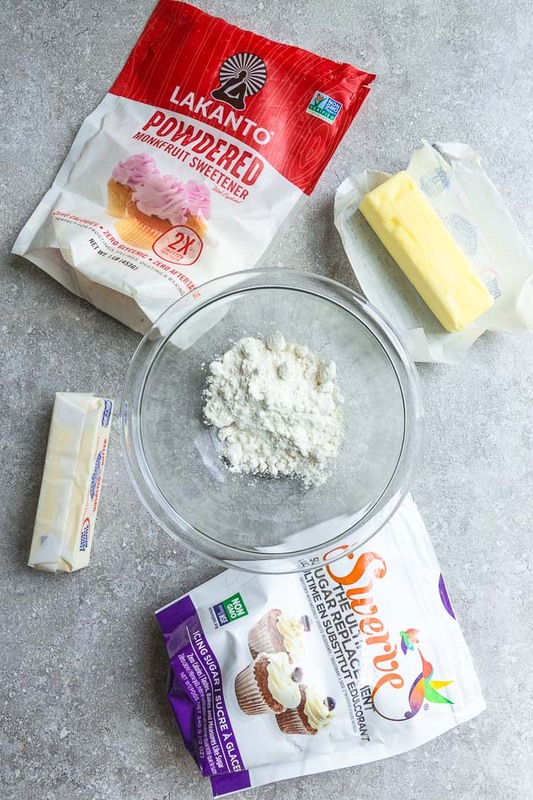 Using a hand mixer or in the bowl of an electric stand mixer, add the softened butter and beat on high for 2 minutes until light and fluffy. Add the cream cheese and continue beating for an additional 3 minutes until combined. Slowly add the powdered sweetener, vanilla extract and almond milk and beat for 2-3 minutes until creamy and smooth. Cover and chill in the fridge until ready to frost. Once the cake layers are completely cool, invert the bottom cake layer onto a cake stand or cake platter and add a layer of frosting, smoothing with a spatula. Repeat with second and third layer (for 6" inch cake) then decorate the top layer (and sides of the cake, if desired) with remaining frosting. Top with chopped pecans and chill in the fridge for an hour or two before slicing. Store cake covered in the fridge for up to 5 days.